We’re back with the latest installment of our spring cleaning DIY series! This week, we’ll focus on the vanity area. If you’re like most women, you probably have dozens of eyeshadow cases, makeup brushes and hair products strewn about your bathroom or bedroom. We’re going to show you six awesome ways to clean up that clutter. Having an organized vanity area also makes it easier to get ready in the mornings. Yay, for finally getting to that 8 a.m. meeting on time! This DIY stand is perfect for all of those random items you don’t know where to put or for those perfumes that have gorgeous bottles. Essentially, this is a cake stand used in a different way. You can find two plates and a small vase at your local dollar store. Use a hot glue gun to attach the plates to the vase. So simple! If you want to add a personal touch, paint the stand to match your bathroom decor. Hair tools can be big and bulky. To find a convenient place to stuff your tools and their cords, use this nifty DIY. Caution: Never store your hair tools while they are still hot because it’s a fire hazard. We had a magazine holder lying around and painted it using a stencil. However, if you’d rather have all of that taken care of, Target has you covered with this one. 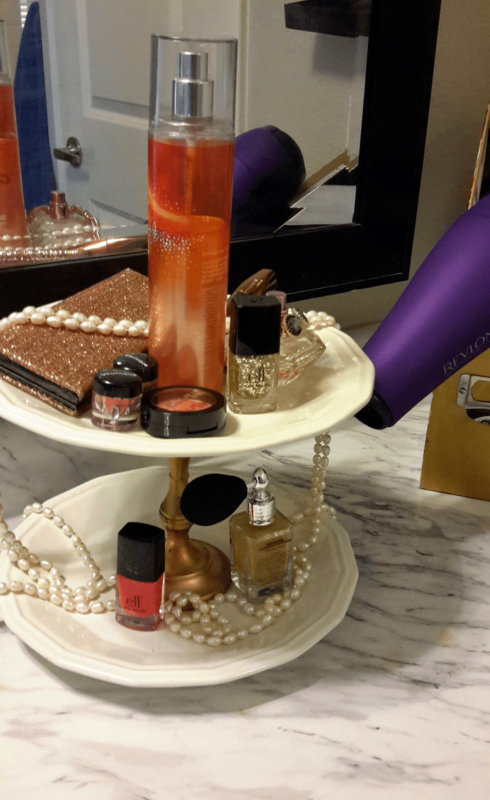 Place the magazine holder on your vanity and that’s it! Hang on to all of your candle containers after the wax was melted. 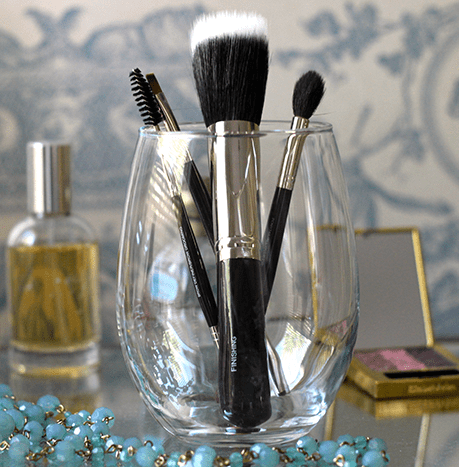 Wash out the votive and you have the perfect container to hold makeup brushes and other beauty tools. Grab some multi-purpose paint from your local craft store and get creative! 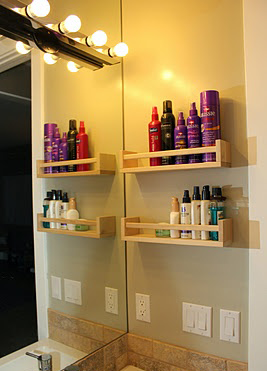 Make more room on your vanity by putting your beauty products on the wall. Wooden spice racks are perfect for paprika and hair spray! Use nails and a hammer to firmly secure the rack along the wall. If you’re renting and don’t want holes in the walls, use an easy-to-remove, damage-free adhesive tab. Gone are the days of endlessly searching for those tiny hair pins. Now they’ll all be in one place and actually stay there. You can find an adhesive magnetic strip at most craft stores. 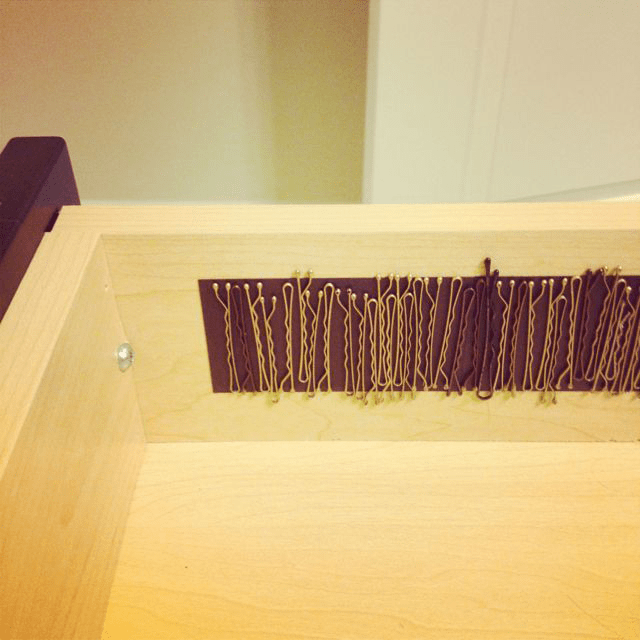 Cut the desired length and attach it to the inside of a drawer or cabinet door. 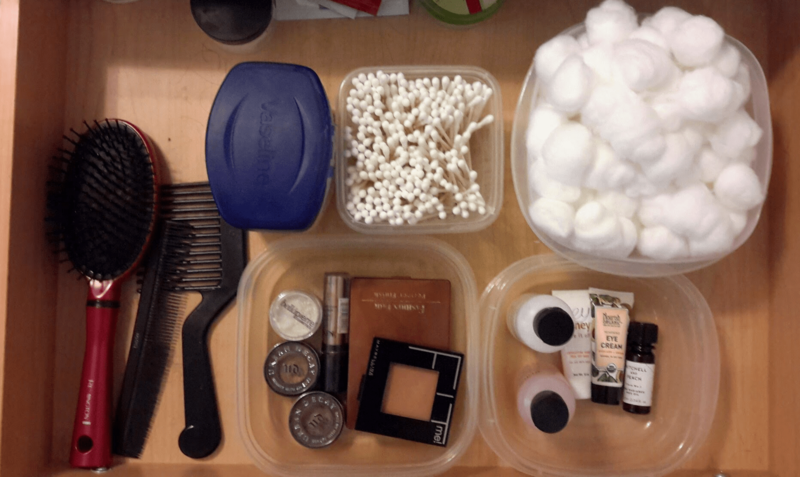 Organize the drawer in your vanity with plastic food containers. You can use the same size and shape, or you can mix it up. It all depends on what you need them for. The best part about using individual containers is that you can take them out of the drawer separately as needed. 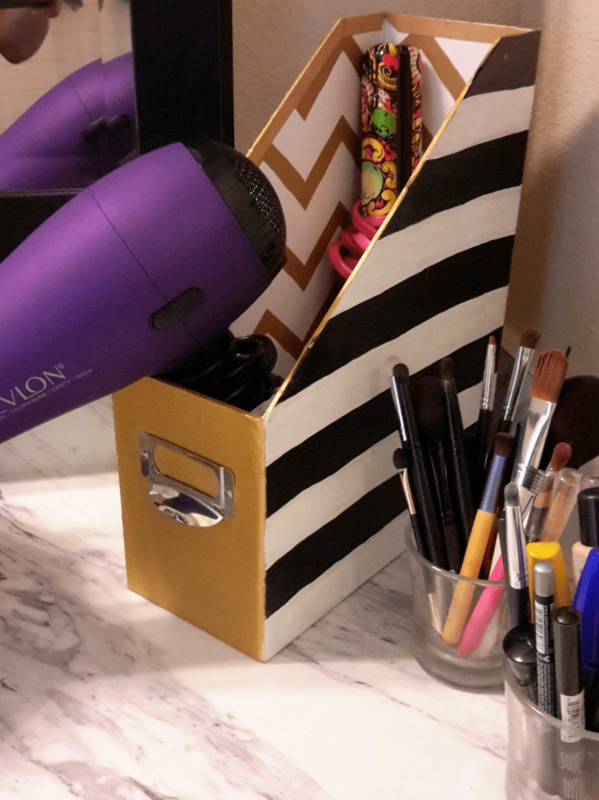 We hope these DIY hacks have helped you organize your vanity in a quick and affordable way. The best part is that this entire project only costs less than $20! Subscribe to the LC Style blog to be the first to know about our next Spring Cleaning DIY Project! Have more ideas on easy ways to declutter the vanity area? Let us know in the comments section.